At the tender age of nine years old, Joseph Semprevivo was diagnosed with diabetes. Instead of sulking about his fate, Joseph was determined to discover ways to enjoy his favorite treats. By the age of 12, he’d developed and marketed a sugar-free ice cream and three years later, he released his first fructose-sweetened cookies and brownies. 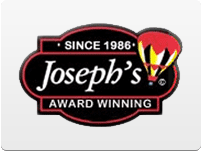 Although originally designed for diabetics, Joseph’s famous low carb, sugar free cookies, all natural peanut butter and sugar free maple syrup have been eagerly embraced by millions of people seeking sugar free foods with great taste.